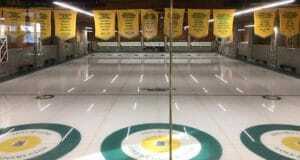 LEDUC, AB – The third day of the 2018 Canadian Collegiate Athletic Association (CCAA) Curling Canada Championships began to sort of out the playoff picture after the afternoon and evening draws, setting up multiple win-or-go-home scenarios heading into the final draw of round robin play on Tuesday. Draw 5 kicked off for the men with an all-ACAC matchup between the NAIT Ooks (3-2) and the University of Alberta-Augustana Vikings (3-2). Curling 80 per cent as a team, the Ooks took advantage of scores in three ends to earn a 7-4 win over the Vikings. In an exciting game between Ontario schools Sault College Cougars (2-3) and Niagara College Knights (1-4), it was the Cougars hanging on for a 9-8 win by scoring a single in the 10th end for the victory. Both teams faced difficult shots throughout the game, with the Cougars curling 70 per cent as a team to squeak out a win at the end. 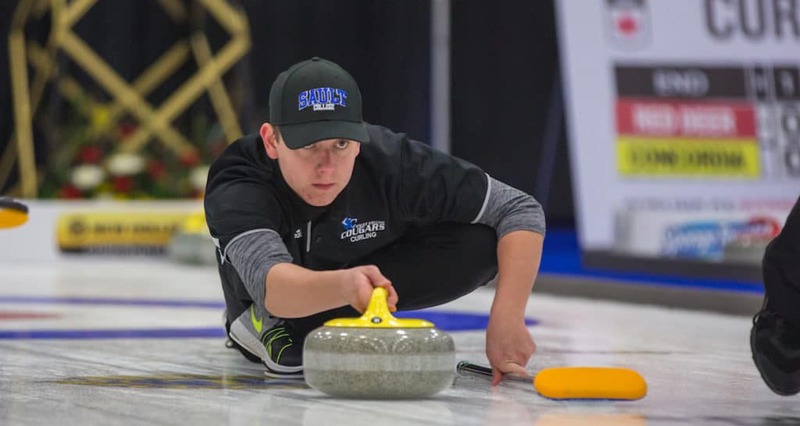 The Concordia University of Edmonton Thunder (3-2) took advantage of a Fanshawe College Falcons (3-2) miscue in the 10th end to steal one as Falcons skip Charlie Richard flashed one through the house to give the Thunder an 8-7 victory. Thunder third Tyler van Amsterdam was solid throughout the game, curling at 81 per cent as the top curler in the match. The final game of Draw 5 saw the Douglas College Royals (5-0) remain undefeated as they earned a 7-5 win over the persistent Red Deer College Kings (0-5). 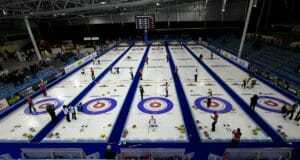 The Kings threw everything they had at the Royals, backed by lead Jordan Smith curling at 91 per cent. With the comeback falling short, the Kings are still in the hunt for their first win, while the Royals have fended off every test so far due to strong and consistent team play. In Draw 6, the Fanshawe College Falcons (4-2) picked up an important win over the Red Deer College Kings (0-6) who shook after eight ends to concede an 8-3 score to the Falcons. Lead Brady St. Louis was exceptional for Fanshawe with a 94 per cent stat line for the game. The Douglas College Royals (6-0) won their sixth game of the championships with an 8-5 defeat of the Concordia University of Edmonton Thunder (3-3). The Royals were clinical in scoring off of mistakes by the Thunder, while providing few opportunities for the Thunder to make a push late in the game. In the feature game being broadcast on CBC Online in Draw 6, the Sault College Cougars (3-3) and the NAIT Ooks (3-3) played an entertaining game, with the Cougars coming out on top. The game was tied 5-5 after eight ends, when the Cougars made a couple nice shots to score three in the ninth end, eventually running the Ooks out of rocks in the 10th. Strong play from the Cougars second Dan Lethbridge (91 per cent) and Ooks lead Sam Stephenson (93 per cent) made for an engaging matchup that delivered a great performance for the online viewers. In the final game of Draw 6, the Niagara College Knights (2-4) proved to be too much for the University of Alberta-Augustana Vikings (3-3), taking an 8-4 win back to the hotel. A stretch of three ends mid-way through the game where the Knights scored points in consecutive ends created a deficit that the Vikings could not find an answer for. The Knights were solid across the board, curling an amazing 86 per cent as a team. In Draw 5 on the women’s side, the Fanshawe College Falcons (4-1) continued to set the pace at the top of the standings as they faced off against the Holland College Hurricanes (1-4). The Hurricanes would give the Falcons everything they had, but it was not enough as Fanshawe walked away with a 9-7 victory to improve their record to 4-1 for the championships. Falcons 2nd Samantha Lees led the way, curling at 83 per cent for Fanshawe. In a battle of the Knights, the Fleming College (0-5) squad was just what Niagara College (3-2) needed to get back into the playoff conversation. Niagara jumped out to an early 4-0 lead after scoring deuces in the first and third ends, while never looking back on their way to a 7-2 over Fleming College. Despite a consistent stat line for Fleming, they just could not recover from a couple of missed shots early in the game. After starting the championships at 0-2, the Camosun College Chargers (3-2) have rattled off three straight wins, with their most recent coming against the MacEwan University Griffins (3-2). The Chargers built up a 5-1 lead after six ends and held on for a 6-3 win over the Griffins. Skip Taylor Reese-Hansen was on fire for Camosun, curling at 85 per cent for the match. The Red Deer College Queens (3-2) picked up their third win of the championships over ACAC rival NAIT Ooks (3-2) behind a strong performance from Shelby Primrose. The convincing 10-5 win was much needed for the Queens as they keep their playoff hopes alive amongst the five teams tied for second place in the standings with records of 3-2. In Draw 6, the Fleming College Knights (0-6) were on a mission to earn a win in the championships with a late rally against the first place Fanshawe College Falcons (5-1). A steal of two in the 10th end fell short of the comeback as the Falcons held on for a 8-7 win. In a back-and-forth match between the Niagara College Knights (4-2) and the Holland College Hurricanes (1-5), it was the Knights coming out on top for a 7-5 victory. Second Renee Boyce led the Knights by curling at 73 per cent, while Hurricanes lead Taya-Ray Crossman stood out curling at 71 per cent. An impressive 93 per cent curled by Red Deer College Queens (3-3) lead Katie Primrose was not enough to best ACAC opponent MacEwan University Griffins (4-2) in the late draw. A steal of four points in the ninth end by the Griffins sealed the fate of the Queens as they could not hold the lead late into the game. The Camosun College Chargers (4-2) continued their notable four-game win streak as they handed the NAIT Ooks (3-3) their third loss of the championships. Chargers skip Taylor Reese-Hansen sustained her stellar play while leading Camosun to a much-deserved 7-5 win. 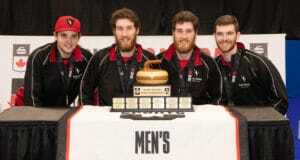 Sheet G will be televised throughout the 2018 CCAA Curling Canada National Championships, and will be available for viewing online at www.cbc.ca/sports.